The Queer Eye star is embarking on a 10-night comedy tour. Jonathan Van Ness makes us cry during every episode of Netflix's Queer Eye. But now, he's ready to make us laugh. The grooming expert is teaming up with Hotels.com to embark on a stand-up comedy tour. The 10-night tour kicked off last night with a show in Brooklyn. 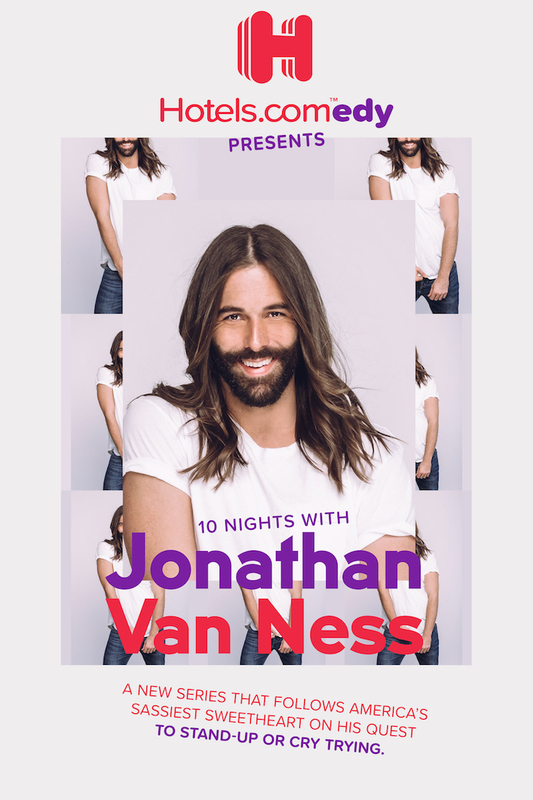 It will culminate with a docu-style web series, entitled Hotels.Comedy Presents: 10 Nights with Jonathan Van Ness, which will give fans a chance to catch every laugh, even if they can't make it to the shows. At the end of the tour, Hotels.com will award 20 lucky fans with a trip to the Reward Night Premiere Party in New York with Van Ness. The party will happen in November as the series premieres on the Hotels.com YouTube. We recently caught up with Van Ness as he prepares to hit the road. We talked comedy, Trump supporters, and his favorite grooming product. How did this stand up tour with Hotels.com come about? This summe,r I got a phone call from Hotels.com, and they said they wanted to help with my dream of becoming a comic. I immediately was like, "Yes, henny, yes!" How could I resist Captain Obvious and that uniform and that gorgeous facial hair? First off, I love Hotels.com because it’s so convenient - it’s a one-stop shop that makes planning travel so easy. Convenience is super important to me whether it’s buying grooming products, shopping, or traveling. I’m excited to hit the road with Hotels.com and travel in style for my comedy tour. This is all a dream come true for me. Believe it or not, I never thought I could be a stand-up comedian until Margaret Cho encouraged me while I was doing her hair at my salon. And now this with Hotels.com? Pinch me. Where are you most excited to perform on your tour? I am so excited to go to Seattle. I’ve never been and am jazzed to experience that gorge city and bring my comedy to its beautiful people. You’ve done some hilarious videos in the past. Do you find comedy to be a therapeutic outlet? Comedy is so, so therapeutic for me, and I hope that it helps others too. Life can be tough, and sometimes you need a laugh to get through it. I find comedy to be like another form of my own self-care and self-love. I hope I can bring a little bit of sweet, gorgeous joy and positivity to others. How do you manage to portray such positivity on Queer Eye? I like to say that I’m an introverted extrovert, and I love finding the best in people and really bringing it out, whether it’s a fab pair of eyebrows or a stunning smile. While I love being with people and spreading positivity and gorgeousness, I also need my alone time to recharge, preferably with my cat. My moments of solitude and recharging help me bring cute energy, on and off the show. How do you find common ground working with Trump supporters and people in the bible belt on the show? Part of the beauty of Queer Eye is bringing together people from different walks of life so that we can all learn something from each other. On the show, we celebrate what makes each of us different but also enjoy finding all things we share in common as humans. A little compassion goes a long way. To end on a lighter note, what grooming product are you most obsessed with right now? Find more info at Hotels.com.